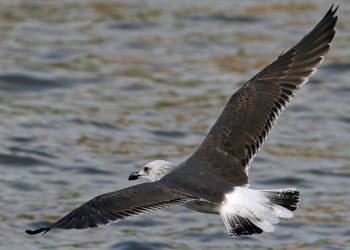 By September all 2cy LBBG are moulting primaries, secondaries and many also moult coverts. 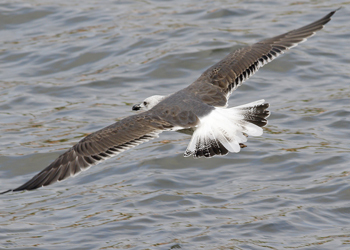 Only a small minority of 2cy LBBG still have old juvenile primaries left in the wing (and this is the last p10, see e.g. picture 2), but many have shed all the juvenile primaries and grow new second generation primaries. Compared to (fresh) juvenile primaries, the top of second generation primaries is rounded. 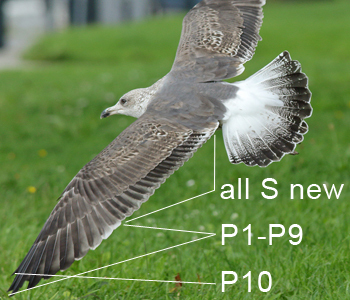 The average moult stage by early September is just above 40, with p7 full-grown, while p8 and p9 are growing. At the end of the month the primary score is over 45, with p7 or p8 full-grown and p9 and p10 growing. On average, the outer secondaries (from S1 inwards) are full-grown by September, but in the inner secondaries have been shed. 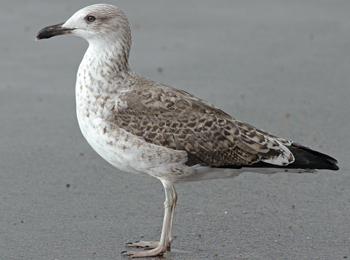 By mid-September, birds can be found with old and new secondaries and gaps of shed feathers. By the end of the month, in most individuals the secondaries have been renewed completely and can be recognized as such by the fresh white tip. 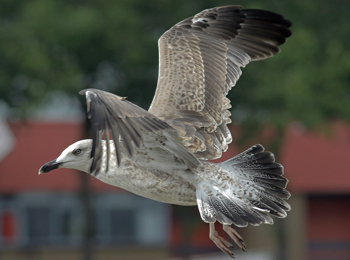 Lesser Black-backed Gull 2CY, September 07 2015, Katwijk, the Netherlands. Retarded bird with small moult gap: P1-P5 new, P6 growing, P7-P10 old juvenile. Old juvenile tail, R2-R3 replaced for 2nd gen (probably in winter). All secondaries old juvenile. 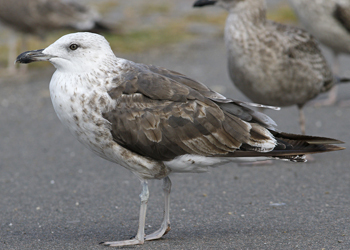 Lesser Black-backed Gull 2CY, September 07 2015, Katwijk, the Netherlands. P1-P6 new, P7 growing, P9-P10 old juvenile. 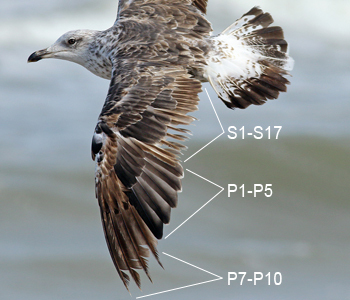 Active moult in tail with R5 still growing; S1 new, S2 missing, other secondaries old juvenile. 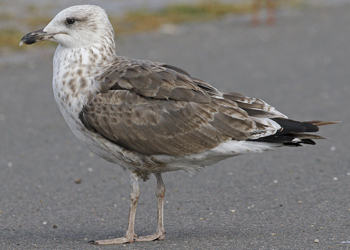 Lesser Black-backed Gull intermedius VPE3 2CY, September 06 2015, Katwijk, the Netherlands. From Denmark. P1-P7 fully grown (P7 just longer than P6), P9-P10 old juvenile. S1 new, S2 growing, S3-S9 missing, S10-S17 old juvenile. 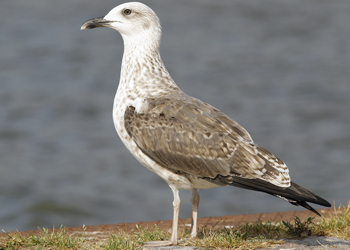 Large moult gap in outer secondaries and small moult gap below the tertials. New tail with R5-R6 growing. 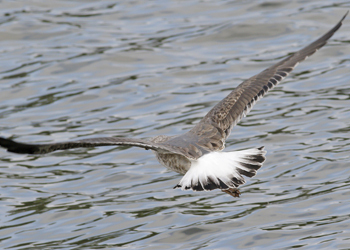 Lesser Black-backed Gull 2CY, September 04 2015, Utrecht, the Netherlands. P1-P7 fully grown, P8 growing. 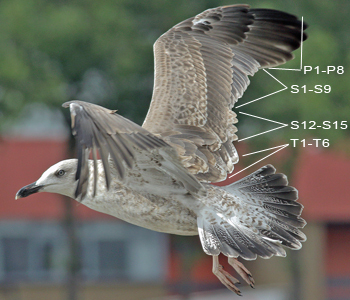 S1-S9 growing, moult wave towards the body. Small block of central secondaries (S12-S15) old juvenile. 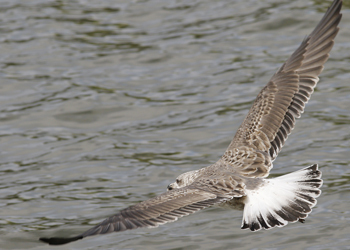 Another moult wave from the lower tertials progressing outwards. Tail new 2nd generation. 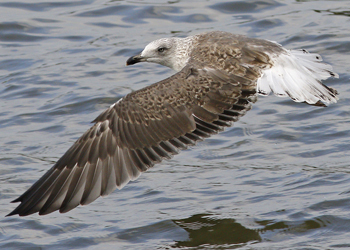 Lesser Black-backed Gull 2CY, September 04 2015, Utrecht, the Netherlands. P10 still growing. All secondaries and whole tail are new. 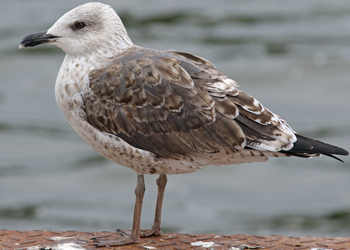 Lesser Black-backed Gull 2CY, September 03 2016, Utrecht, the Netherlands. Complete moult: P8/-. PMS=47. 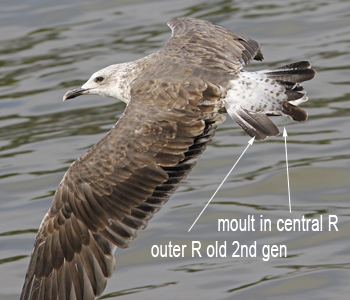 Central rectrices moulting to 3rd gen.
On average the tail has completely been renewed into second generation. Typically, the contrast is obvious: the base commonly shoes vermiculation on the edge of a broad black tail-band and a small white fringe at the tips. 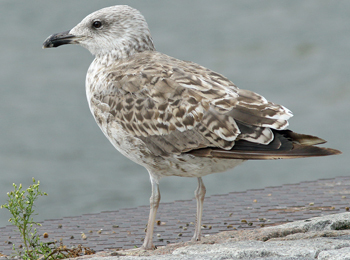 In some individuals, the tail-feathers are abraded already with the tips worn away. 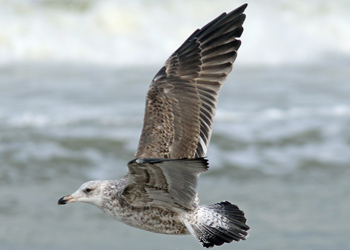 Probably, these are the birds that had replaced the complete tail earlier in the season (in spring). 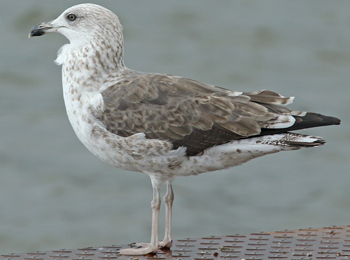 The upper-tail coverts normally show broad brown bars. LBBG intermedius J369N 2CY, May 27 2016, Utrecht, the Netherlands. Bird returned with complete 2nd gen tail. Complete summer moult not started yet. LBBG intermedius J369N 2CY, September 03 2016, Utrecht, the Netherlands. Complete moult ending with: P7 fully grown. 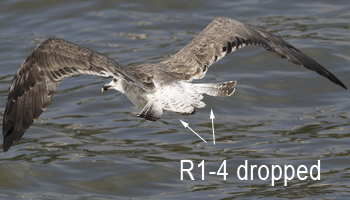 R1-R4 dropped again, now moulting to 3rd gen tail-feathers. 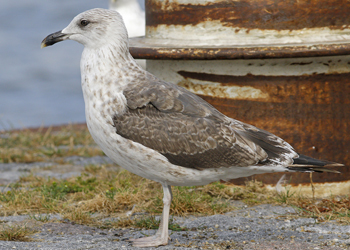 Extensive late-winter moult in 2CY birds occurs more commonly in intermedius than it does in graellsii. 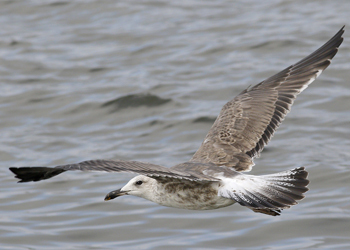 Such birds with extensive moult return in N Europe with replaced rectrices (2nd gen R). 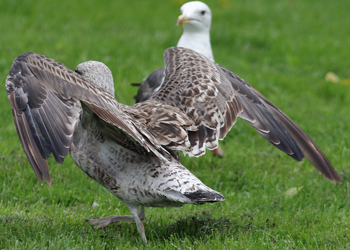 With the tail completely 2nd gen, what will they do in the complete moult in summer? This bird J369N is a nice illustration. 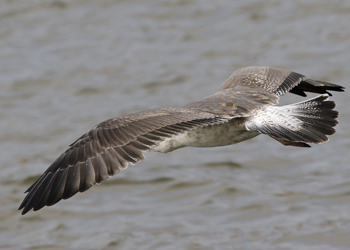 All scaps were replaced, and also nearly all the visible wing-coverts replaced for 2nd gen feathers. 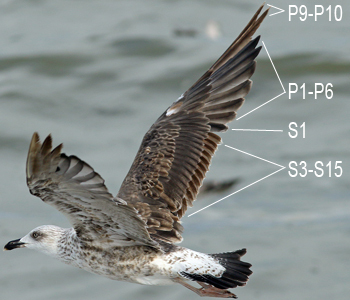 In the spread wing it shows that the last outermost coverts are still juvenile (like 5x outermost GC, single MC and few LC). 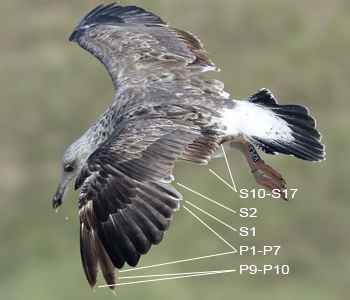 All 6 tertials and all 6 pairs of tail-feathers have been replaced too for 2nd gen, but secondaries and primaries remained juvenile (except for 1x central secondary in left wing, but none in the right wing). 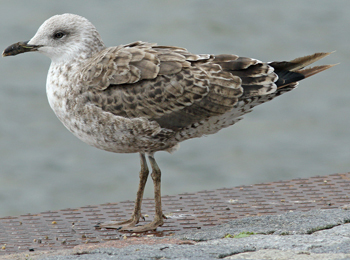 Fortunately, J369N could be observed throughout the summer months and by early September the tail appeared to be in moult again. Therefore we may conclude that 3rd gen rectrices in September-October 2CY do occur. 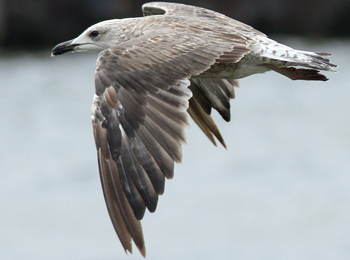 The tertials are missing or have been replaced by second generation feathers. The upper two tertials normally are the last to be moulted. 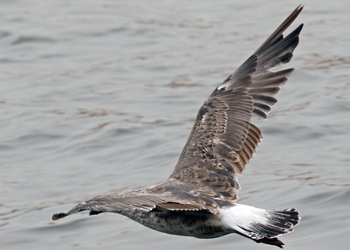 The new tertials have an extensive brown-black centre, a white bar at the tip and a sub-terminal anchor pattern at the tip. Sometimes a (single central) tertial may appear grey-centred with an arrow-head; a faint brown pattern along the fringe and a faded white tip (see for instance image 7). Probably, these feathers are already 3rd generation feathers and have replaced tertials which were included in last autumn's moult. 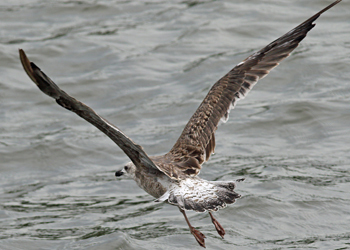 In all the wing covert bars, active moult may be in progress. 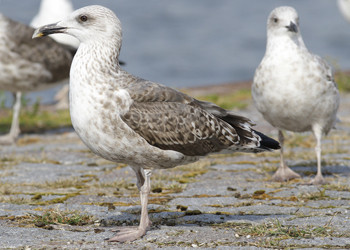 In several individuals moult to second generation greater coverts and outer lesser coverts have to be finished as late as the end of September. Normally the median coverts are the first to be moulted, early in the season. 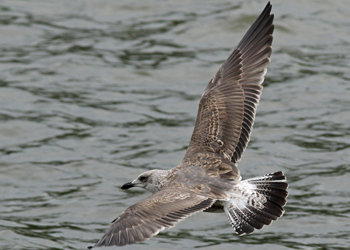 By September however, it's still possible to find 2cy LBBG which have shed the median coverts, growing new feathers in. These birds are moulting the median coverts again into 3rd generation feathers. 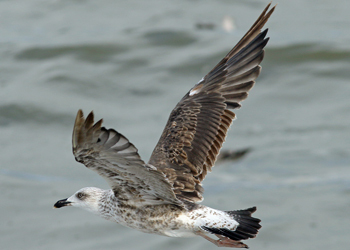 In pattern they resemble the anchor or barred patterned 2nd generation feathers (see image 7). 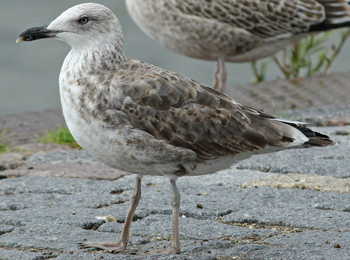 Other individuals show the pattern as seen in presumed intermedius LBBGs: plain brown-grey coverts with a pronounced black wedge at the cente (see e.g. image 5 and image 6). These feather groups have been renewed by neat feathers, with fine streaks on the ear coverts and neat vermiculate bars on the flanks (see e.g. image 1). Lesser Black-backed Gull graellsii A:D58 2CY, September 16 2016, Leixões harbour, Matosinhos, Portugal. Picture: José Marques. 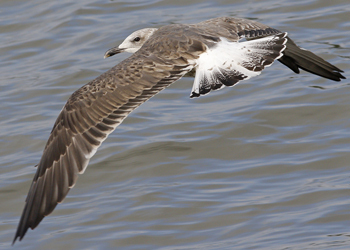 Lesser Black-backed Gull graellsii 3R9:C 2CY, June & September 2015, Leixões Harbour, Matosinhos, Portugal. Picture: José Marques. LBBG 2cy 0.S7 Westkapelle, the Netherlands, September 23 2010. 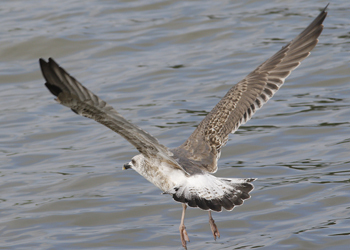 Lesser Black-backed Gull graellsii 0FF6 2CY, June & September 2016, Leixões harbour, Matosinhos, Portugal. Picture: José Marques. 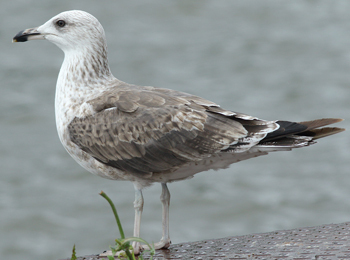 Lesser Black-backed Gull graellsii 1CS9 2CY-4CY, March 2015 - June 2017, Matosinhos, Coimbra, Portugal. Picture: José Marques. LBBG CCV September 08 2008, Madrid, Spain. Picture: Delfín González. LBBG 2cy PZP Le Portel, NW France, September 21 2002. The primary moult score: P9 fully grown. 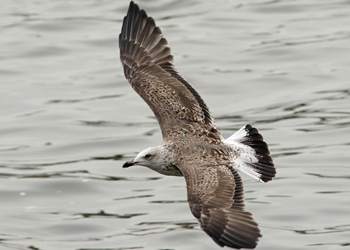 Lesser Black-backed Gull graellsii F:234 2CY, September - October 2016, Leixões harbour, Matosinhos, Portugal. Picture: José Marques. 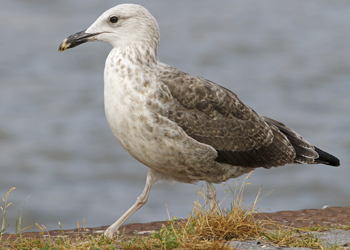 Lesser Black-backed Gull graellsii F:270 2CY, September - November 2016, Matosinhos Beach, Matosinhos, Portugal. Picture: José Marques. Lesser Black-backed Gull graellsii F+Z 2CY, September - October 2016, Matosinhos beach, Matosinhos, Portugal. Picture: José Marques. 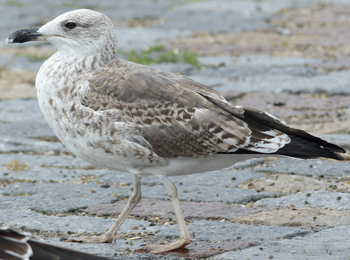 Lesser Black-backed Gull graellsii L+R 2CY-3CY, July - October 2015 & November 2016, Matosinhos, Portugal. Picture: José Marques. 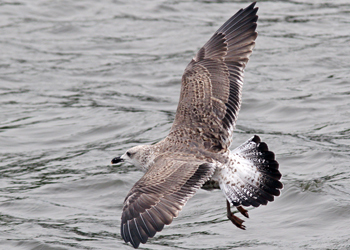 2cy LBBG from France: graellsii "Dutch intergrade"
Lesser Black-backed Gull graellsii R:V1H 2CY, September 29 2015, Leixoes harbor, Matosinhos, Portugal. Picture: José Marques. LBBG 359N September 16 2007, Madrid, Spain. Picture: Delfín González. Also as 7-8cy. 2cy LBBG from Belgium: graellsii "Dutch intergrade"
LBBG 2cy DUAD Westkapelle, the Netherlands, September 27 2007. 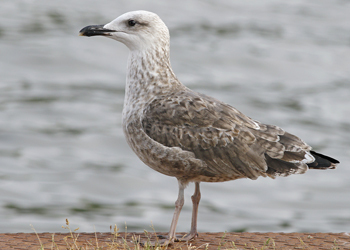 Lesser Black-backed Gull graellsii D.UAK 2CY & 10CY, September 2007 & April - May 2015, the Netherlands. Picture: Merijn Loeve & Pim Wolf. LBBG 2cy LPAR Westkapelle, the Netherlands, September 22 2010. LBBG 2cy L-51910 Le Portel, NW France, September 22 2002. P9 fully grown. 2cy LBBG from the Netherlands: graellsii "Dutch intergrade"
Lesser Black-backed Gull graellsii 4X 2CY, September 26 2016, Matosinhos, Portugal. Picture: José Marques. 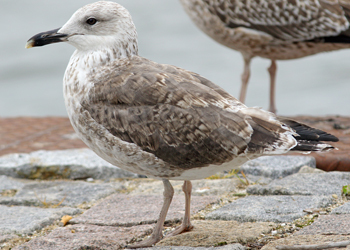 Lesser Black-backed Gull graellsii FW 2CY, September 07 2016, IJmuiden, the Netherlands. 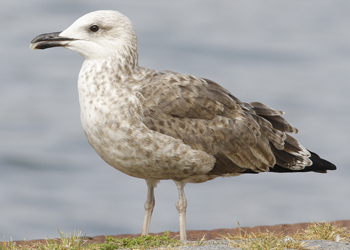 Lesser Black-backed Gull graellsii JV 2CY-3CY, September 2016 & March 2017, Matosinhos, Portugal. Picture: José Marques. LBBG S2 September 21 2008, Madrid, Spain. Picture: Delfín González. Also see in Febr 2008. LBBG KD March 2008 - March 2009, Madrid, Spain. Picture: González & Martin. LBBG XB September 16 2007, Madrid, Spain. Photo by Delfín González. LBBG F7 September 27 2009, Madrid, Spain. Photo by Delfín González. LBBG LK September 19 2010, Madrid, Spain. Photo by Delfín González. LBBG 2cy LL September 29 2004, Westkapelle, the Netherlands. P9 fully grown. 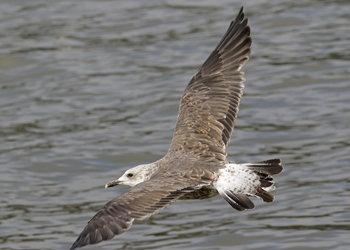 Lesser Black-backed Gull YBDF 2CY, September 06 2013, Comenar Viejo, Madrid, Spain (40°15'41"N 003°38'00"W). Picture: Delfín Gonzalez. LBBG 2cy IE September 18 2003, Naaktstrand, Maasvlakte, the Netherlands. LBBG 2cy B14 Naaktstrand, Maasvlakte, September 01 2003. LBBG 2cy 5.429.299 September 09 2010, IJmuiden, the Netherlands. LBBG 2cy C95E September 25 2004, Amsterdam, the Netherlands. Deformed bill. 2cy LBBG from N Germany: "Dutch intergrade"
LBBG 2cy H.709 September 10 2009, Westkapelle, the Netherlands. LBBG 2cy H.746 September 12 2009, Westkapelle, the Netherlands. LBBG 2cy H.762 September 10 2009, Westkapelle, the Netherlands. 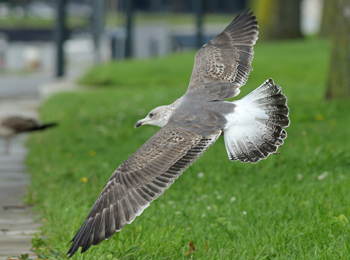 Lesser Black-backed Gull graellsii DEH N121720 2CY-3CY, September 04 2015 & August 17 2016, Utrecht, the Netherlands. LBBG 2cy 4285081 Oostende, Belgium, September 04 2005. From Helgoland, N Germany. LBBG V241 IJmuiden, the Netherlands, September 22 2009. P7 new; P9 & P10 juvenile. Lesser Black-backed Gull intermedius V.AP1 2CY, September 10 2017, Katwijk, the Netherlands. Lesser Black-backed Gull intermedius V.AY4 2CY, September 17 2017, Katwijk, the Netherlands. Lesser Black-backed Gull intermedius V.EN1 2CY, September 05 2016, Katwijk, the Netherlands. LBBG intermedius 2cy VH60 September 04 2011, Utrecht, the Netherlands. Lesser Black-backed Gull intermedius VM2N 2CY, September 17 2013, Katwijk, the Netherlands. 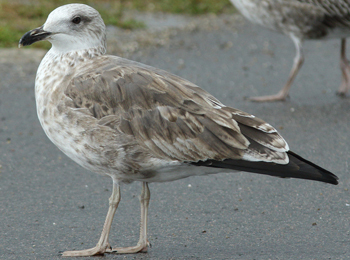 Lesser Black-backed Gull intermedius VPE3 2CY, September 06 2015, Katwijk, the Netherlands. 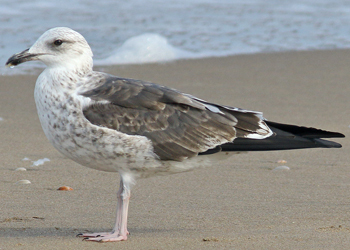 Lesser Black-backed Gull intermedius V.W8M 2CY, September 01 2015, Matosinhos beach, Matosinhos, Portugal. Picture: José Marques. 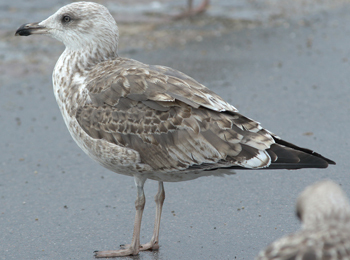 LBBG intermedius J0K0 1CY-6CY, August 2008 - May 2013, Norway - Denmark - Spain - Morocco - the Netherlands. 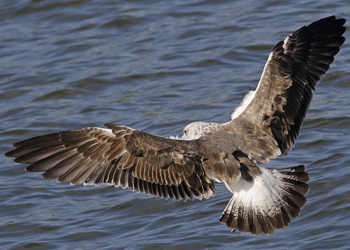 Arrested moult in 3CY after an extensive moult at the wintering grounds in Morocco. LBBG 2cy J6T5 September 01 2009, Westkapelle, the Netherlands. LBBG 2cy JH00 September 16 2007, Madrid, Spain. Photo by Delfín González. LBBG 2cy JN08 September 10 2007, Boulogne sur mer, NW France. Picture: Jean-Michel Sauvage. LBBG 2cy JR43 September 24 2007, Westkapelle, the Netherlands. LBBG 2cy JYU7 September 24 2010, Westkapelle, the Netherlands. LBBG 2cy JZH9 September 09 2010, Westkapelle, the Netherlands. LBBG 2cy J0747 September 23 2010, Westkapelle, the Netherlands. 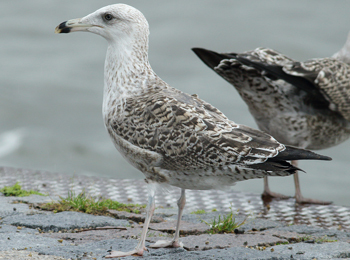 Lesser Black-backed Gull intermedius J369N 2CY, May, July & September 2016, Utrecht, the Netherlands. 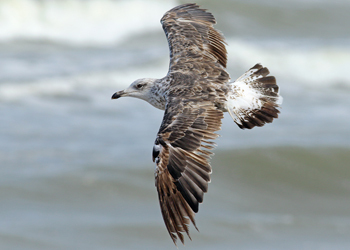 Lesser Black-backed Gull intermedius J492L 2CY, September 06 2015, Katwijk, the Netherlands. Lesser Black-backed Gull intermedius J725N 2CY, September 20-23 2016, Angeiras & Leça beach, Matosinhos, Portugal. Picture: José Marques. LBBG 2cy J6PH September 16 2007, IJmuiden, the Netherlands. 2cy & 4cy. LBBG 2cy JS94 Le Portel, NW France, September 21 2002. The primary moult score: P8 fully grown. LBBG 2cy JV28 Le Portel, NW France, September 21 2002. P9 fully grown. LBBG 2cy JX86 Scheveningen, the Netherlands, September 16 2002. P7 new; P9 & P10 juvenile. LBBG 2cy 4139766 Westkapelle, the Netherlands, September 29 2004. 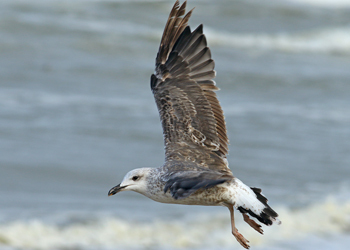 Lesser Black-backed Gull 2CY, September 19 2013, Katwijk, the Netherlands. Lesser Black-backed Gull 2CY, September 25 2012, Katwijk, the Netherlands. 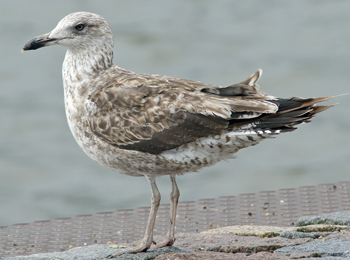 Lesser Black-backed Gull 2CY, September 09 2016, Utrecht, the Netherlands.